Thinking about what to invest in, in Jacksonville? You might find this interesting: vacant land is a compelling opportunity right now. Make sure you read this blog post to learn 4 reasons why investing in vacant land in Jacksonville might be a viable option. When you ask some real estate investors what you should invest in, they’ll probably tell you that you should invest in houses. However, that’s not the only way to invest! There are many different viable investments, including commercial property, vacation property, and even vacant land! Vacant land may provide one of the most compelling investment opportunities right now. Here are 4 reasons why investing in vacant land in Jacksonville might be a viable option. 4 Reasons Why Investing In Vacant Land In Jacksonville Might Be A Viable Option. No one is making more land, yet there are more and more buyers. Therefore, the price of real estate tends to go up. (Sure, there are prices variations in the short-term but over the long-term, prices tend to rise.) 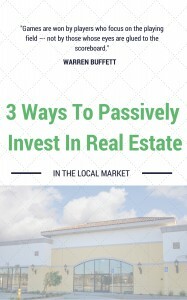 Therefore, an investment in real estate has historically provided a positive return. Investing in a rental property or vacation property gives you just one way to make money – rental income! But when you invest in vacant land, you can sell it, rent it, develop it and rent it, develop it and sell it… and more! The sky’s the limit, which means you have more ways to create a positive return. In general, the population grows faster than it declines. Some of this growth is from people moving from one area to another, and a lot of this growth is from babies being born. Well, those new-to-the-area people will want houses, so will the families with babies… and someday those babies will grow up and want homes of their own! Owning vacant land positions you to serve any of these groups that you choose. You might be reading this and wondering if the market is not very good and whether you should wait to make the investment. However, just remember this: all markets are different and local markets don’t necessarily follow the national economy. Besides, markets may go up and down but, over time, economies tend to rise. Therefore, if you buy during a market decline, that’s great because you bought low and you can wait to sell high; or, if you buy during a market rise, that’s great too because you have many ways to add even more value during a period of increased demand. From residential to commercial to vacation properties – there are many compelling investment opportunities but these are 4 reasons why investing in vacant land in Jacksonville might be a viable option for you.